The heat wave in NY reached an all-time high this week, which had me sticking to my lightest & breeziest pieces possible. 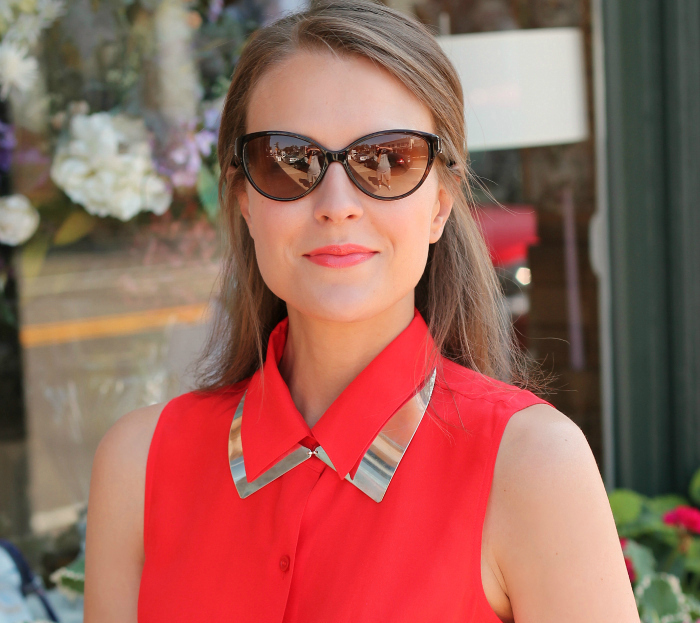 A silk sleeveless top & airy pleated maxi kept me just as cool as a tank & shorts, but was the dressed-up option I needed for a day of lunch & window-shopping with my girlfriend. I’m glad I took the opportunity to get a little break in before our big move this weekend – we get the keys to our new house tomorrow! It’s going to be a lot of work transitioning and though I’m sad to leave behind my closet room, I’m thrilled to be gaining my own home office (pictures to come soon). Perfect maxi skirt and bag! Such a gorgeous look and I am absolutely loving that bag!! It's been so hot and humid here in Toronto also!! What an unexpected color combination, and you are soooooo making it work!! Love the collar layering! Hope you are having a wonderful day! Fabulous and unusual colour combination which gives a fresh touch to your look! Gorgeous. I WANT that skirt! I just LOVE this color combo! Hope the move goes smoothly! Beautiful pleated maxi skirt. The combination of these two colors is great for Summer and vibrant! Love the tied top!! I love this color combo. It's so vibrant and perfect for summer. It's hard to find something cute and comfortable to wear in this heat but you nailed it! That skirt is just gorgeous. I love that maxi skirt! The color, the pleats, everything about it is so pretty! Such a gorgeous and fun color combo! And love how you're wearing that necklace! Such pretty colors, I love that pleated skirt! LOVE this color combo! 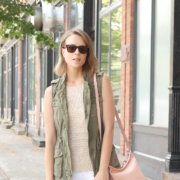 Such a great transitional summer-to-fall look. Just add a jacket and you're good to go! nice combo, the red and orange. that skirt is absolutely gorgeous!!! I actually don't have that problem with mine, so I'm not sure if you received a defective one? Does yours have the snap on the inside to hold it in place? That is what keeps mine intact. I will try to figure something out, thank you so much!! Love the mix of these colors! So gorgeous! WOW you look fabulous! I love the red with the tangerine skirt. I literally have no words! Happy Weekend! 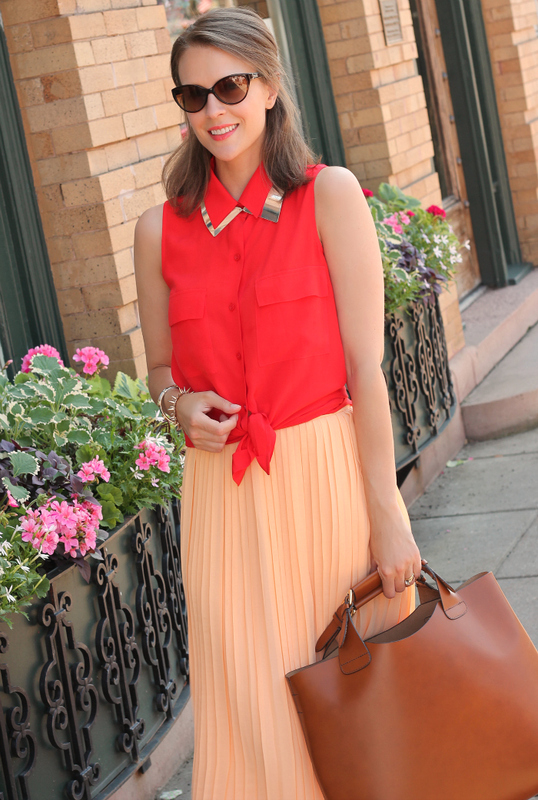 Love this fun color combo, so perfect for summer – and that skirt is pure perfection. I think I may need to add more peach pieces to my wardrobe. I love love love this color combo! Have a fab weekend! I absolutely love that bag! Great sale price too! Stay cool! So chic! Very Audrey Hepburn! Perfect skirt, and love the bag. You look amazing as usual. This is such a lovely outfit. 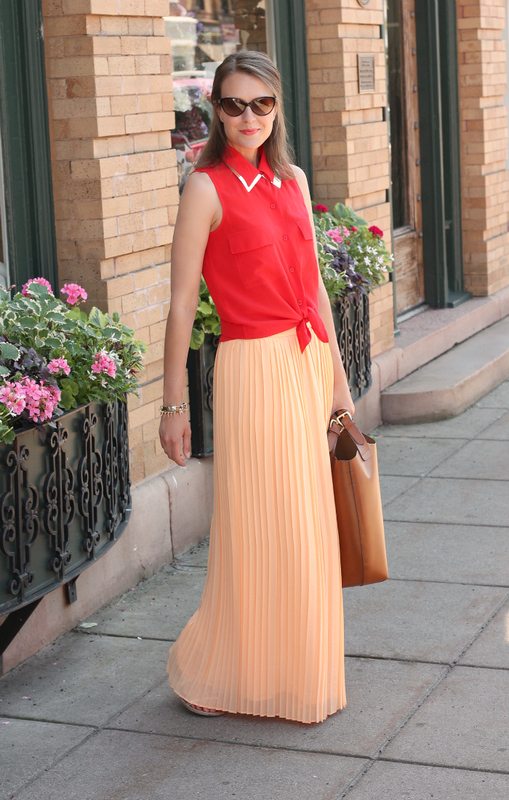 The colors and maxi skirt are perfect for summer. I love that your maxi has a full slip – this makes so much more sense than the silly little mini slips! I love the collar necklace under your collar. It is definitely a chic factor! Good luck with the move! I love the colors! That maxi skirt is so lovely! I am in love w/ your collar necklace! It add such a great bit of edge to this look! 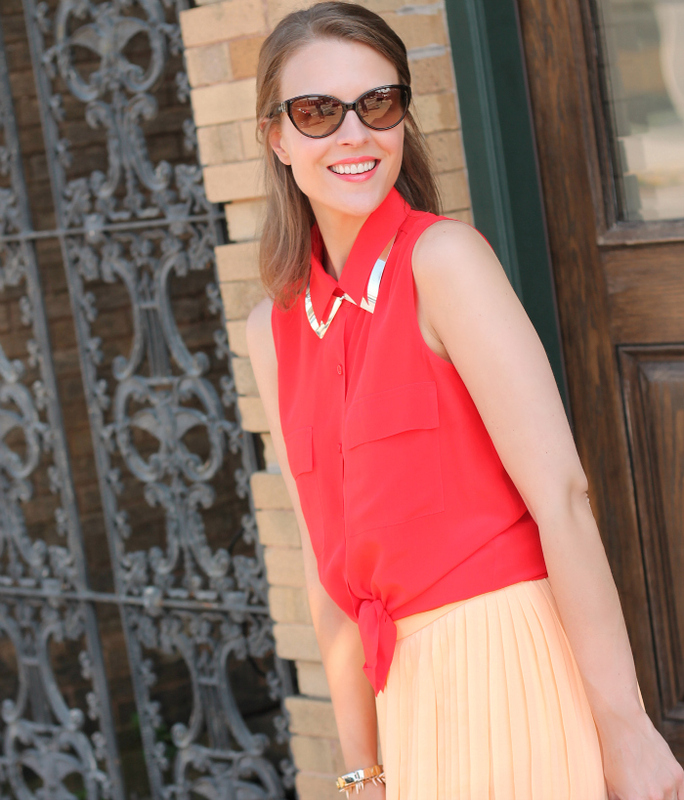 Red and peach are defintley two colors that are meant to go together and a great combo for summer! AWWW this post Is TO cute:) and you look SO beautiful. Sleek and chic! Love your skirt and bag! Loving this color combination, so summery! WANT this maxi! too cute! this is completely un-related to your outfit (which I love by the way), but I noticed that you have AMAZING skin! I was wondering if you were born blessed or if you have a beauty routine that you could share. Thanks!